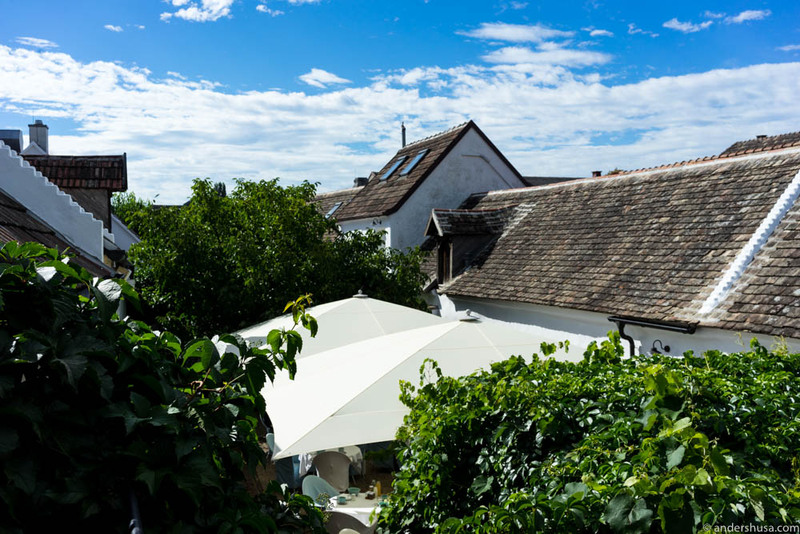 Situated in Burgenland, 45 minutes from Vienna, in the small town of Schützen am Gebirge, you find the restaurant and boutique hotel Taubenkobel. Geographically, we are in the ancient Pannonian region, in the South-Eastern part of Austria, with only 15 minutes by car from the border of Hungary, and 35 minutes to Slovakia. Hungary is also reachable by boat across Lake Neusiedl. 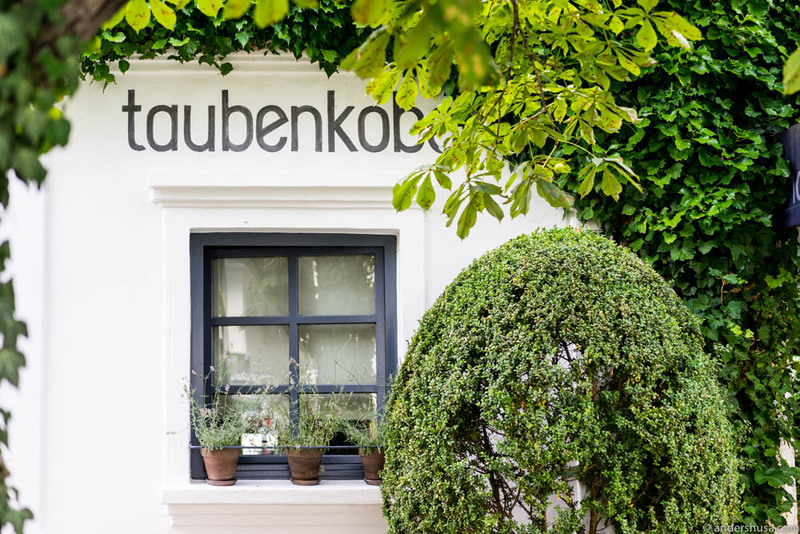 Restaurant Taubenkobel used to have two Michelin stars before the French guide discontinued their Austria edition in 2009. 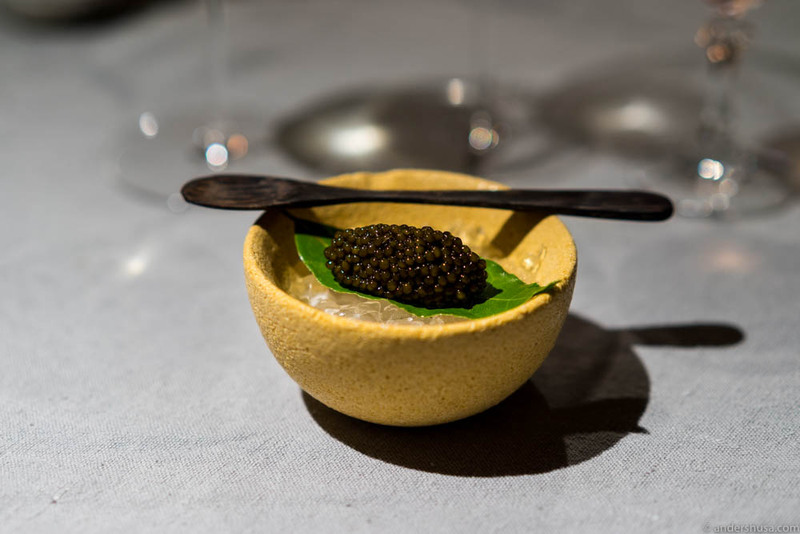 Now, with only the capital of Vienna, and the city of Salzburg, being included in the major cities of Europe, this luxury resort and gourmet restaurant has become more of a hidden gem for destination diners. We were greeted upon arrival by the lovely co-owners, head chef Alain Weissgerber and his wife and restaurant manager Barbara Eselböck. He’s French, she’s Austrian. Taubenkobel has been in the Eselböck family since 1984. The old farm house dates back to the 19th century and was originally purchased by Barbara’s parents: Eveline and Walter Eselböck. Walter was the chef back then, and Eveline, who has a strong passion for natural wines, was the first female sommelier in Austria. She’s so cool that she served wine pairings with naturally fermented grape juices at least 20 years before it became trendy. Eveline’s other daughter and Barbara’s sister, Stephanie Tscheppe-Eselböck, make one of the finest biodynamic wines of the region. Together with her husband, Eduard Tscheppe, she founded Gut Oggau 10 years ago. Yes, those awesome wines with different faces on the labels that express the character of the content. Around the millennium, Eveline and Walter added the first three rooms, making Taubenkobel into a hotel as well. Shortly after, they saw the need for another, but simpler eatery. – My father wanted to have a glass of wine after he had worked in the kitchen, so he decided to build his own wine bar, Barbara told us. 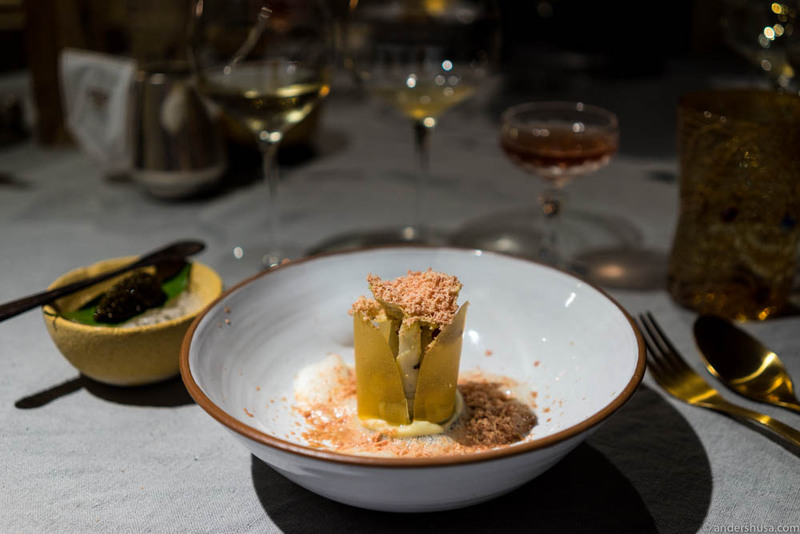 Today, there are 2 rooms and 11 extravagant suites in total at Taubenkobel, and the small wine bar next door has become a full-scale bistro with over 20 courses on the menu. 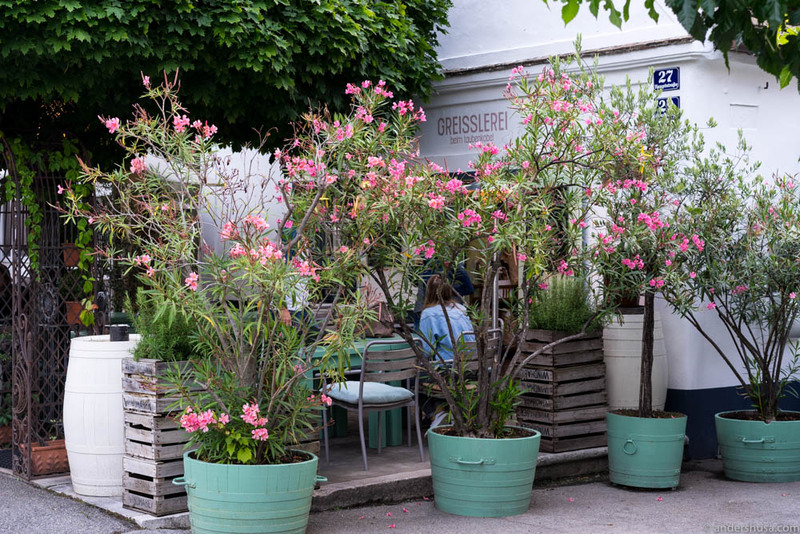 The Greisslerei, as it is called, is more informal and relaxed, and you can even buy some groceries in their store. When guests of Taubenkobel wake up each morning, they head down to the Greisslerei for a hearty breakfast. In 2012, Eveline and Walter decided to hand over the restaurant to their daughter Barbara and her husband. After a transition period of three years, it was finally time, in 2015, for the younger generation to continue the life-work of Barbara’s parents on their own. Taubenkobel means pigeon house, but the suite we stayed in was as far from a bird’s home as you can possibly imagine. Decorated with designer furniture and modern art. Particularly eye-catching was one of the tables, sporting a half-naked woman underneath, by controversial artist Allen Jones. Our living room featured a huge comfy sofa, a vinyl player (played through all records! ), yoga mats (didn’t use) and a fine liquor selection (didn’t drink). 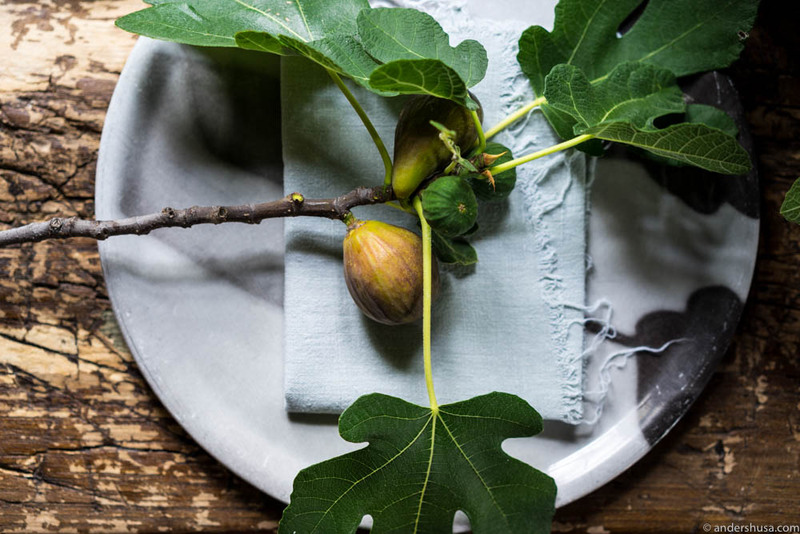 A couple of fresh figs, still on the branch and recently cut from the tree, was awaiting us when we arrived. They were delicious. Our bedroom was equipped with a divan and a king-size bed, while the bathroom came complete with everything you could desire: a huge marble bath tub (which we failed to use during our stay), a big luxurious shower, and top quality soaps and shampoos from the esteemed brand Malin + Goetz. If you would rather live more affordable when visiting Taubenkobel, the Eselböcks also run a casual bed and breakfast, Pension Drahteselböck, in the neighboring town of Rust. We were unlucky to get rain on the first day (good for the winemakers, but bad for us) and had a rather packed schedule of winery visits the next one (more stories will follow). Thus, we only found time for a quick stroll through the beautiful lush gardens of the Taubenkobel resort. 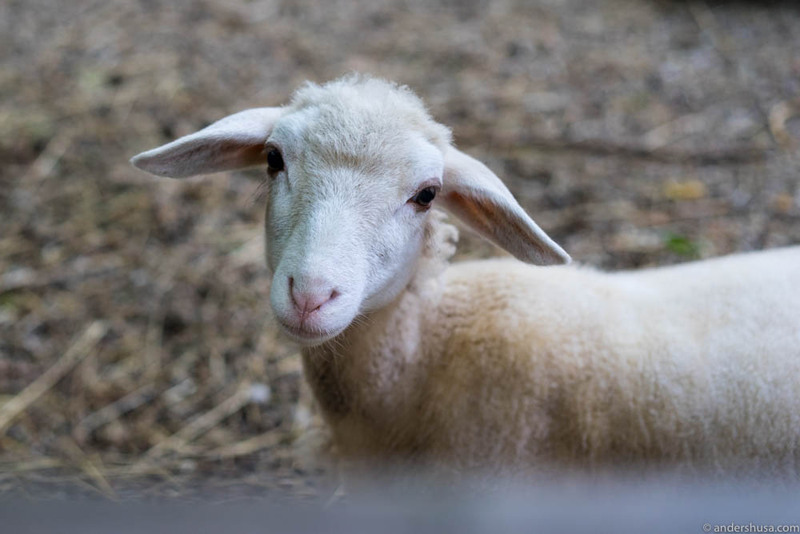 There’s a small pond where you can take a bath, sunbeds equipped with Taubenkobel-branded Fedora straw hats, trees full of fruit, and even two cute lambs who live behind a fence in the back yard. I really wish we had more time to enjoy all this, and we have already decided that we need to go back one day. The evening of our dinner at Taubenkobel arrived all too early – but, luckily, we had hours of great food and wine ahead of us. The age-old dining room is one of those spaces where you just wanna sit and observe everything around you. Some interior design elements from the 1800s have been kept, and stand in stark contrast to the modern art on the wall. Donated by local artists, Barbara could reveal. – They love to come here and eat, and, sometimes, they pay with their artworks. 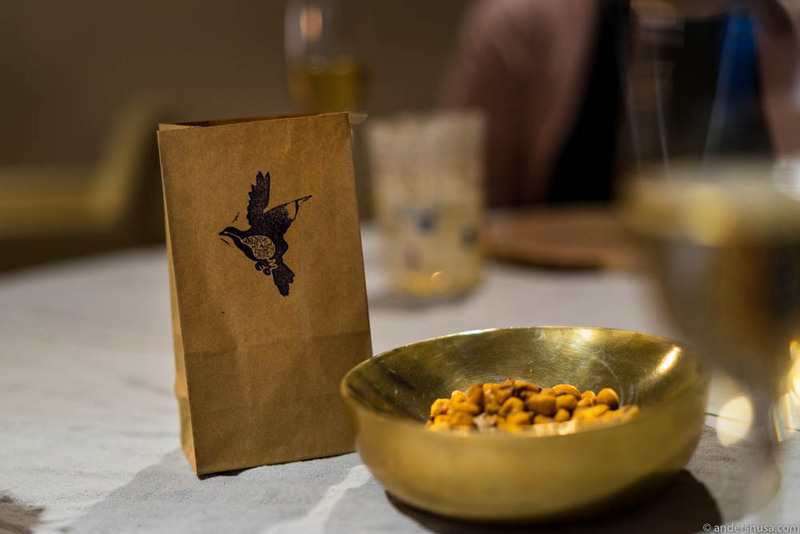 The first snack of the meal was pigeon food, of course! Next up: a fishbone with three variations of fish from the nearby muddy lake. 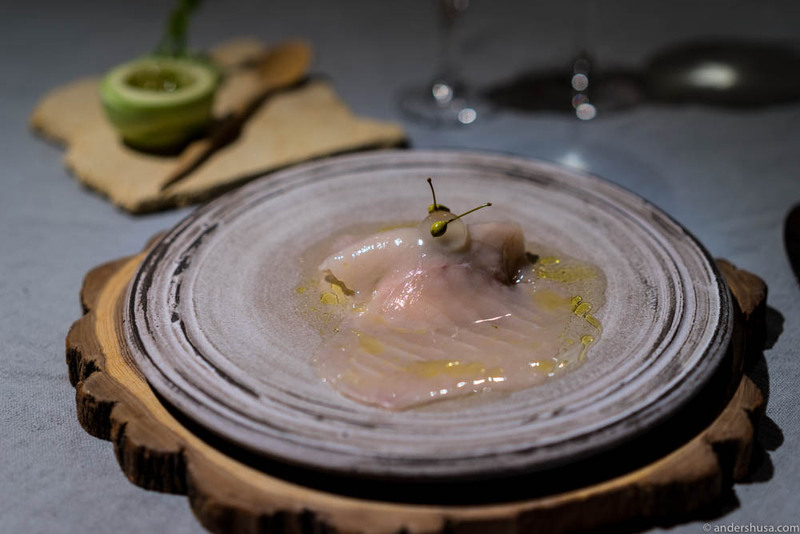 Chef Weissgerber has continued the philosophy of his predecessor by using mainly local produce. 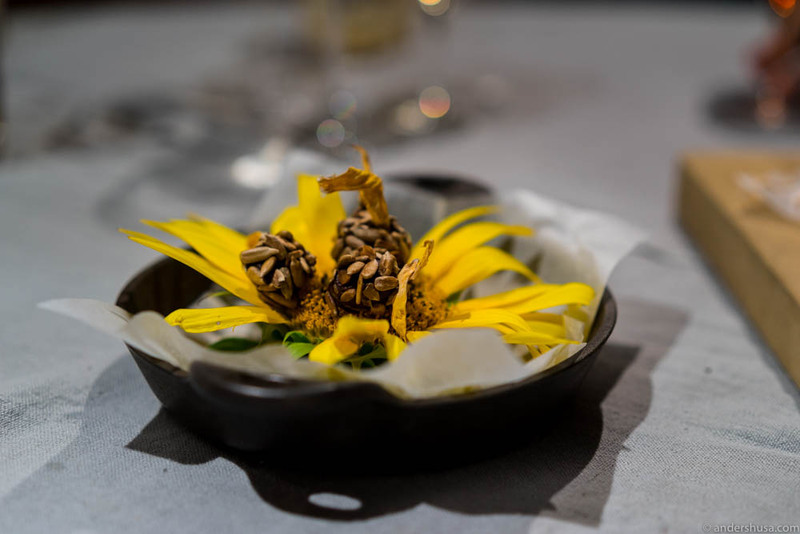 On our plates this night, we were told, would be organically grown vegetables from farmers of the region, and wild herbs and plants gathered in the meadows and hills around Lake Neusiedl. Alain wants people to understand and taste the area where they are dining. 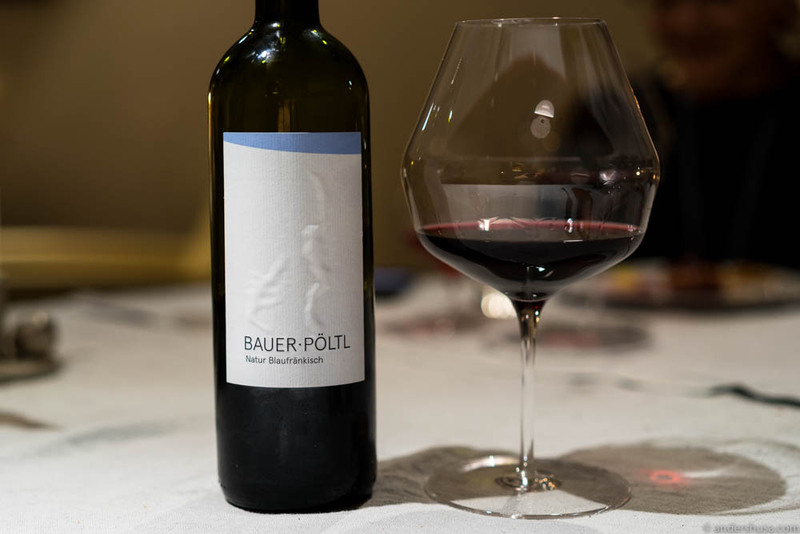 Head sommelier Peter Müller presented one of my most beloved wines from Gut Oggau to go with a course of Caesar’s mushrooms. – Here we have Timotheus, which is a blend of Grüner Weltliner and Weissburgunder (Pinot Blanc). 2015 is the vintage, stomped by foot, with a lot of love, Peter explained. The bright yellow juice is fermented in old wooden casks and stored for 18 months. No filtration, no fining, and no added sulfur. Fresh fruits and exotic aromas, with a sharp acidity, yet round and buttery mouthfeel. Caesar’s mushrooms cut in half – fascinating! 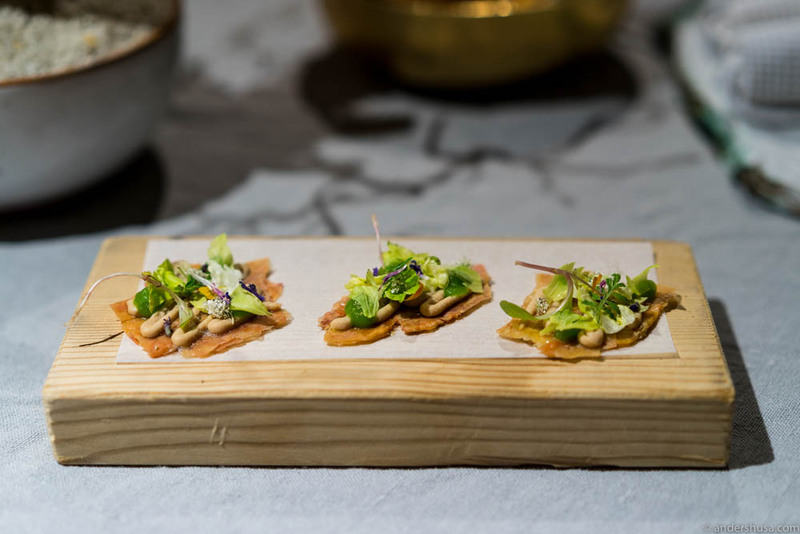 Caesar’s mushrooms, or Kaiserling in Austrian, is as rare as truffle and highly regarded. They are picked young when a universal veil still encloses the actual mushroom. White as a snowball, round as an egg. Cut in half, it looks like a mushroom within a mushroom. – In Italy, they eat them in thin slices with only olive oil and salt. You don’t wanna cook them too much because they have such a special taste, and they’re really not easy to get. We have it for two weeks only, explained Barbara. We got delicate sheets of the mushroom on top of a savory poppy seeds cake, with a mushrooms sauce and a cream of leek and sour cream. Topped with poppy blossoms for decoration. It was my favorite dish of the meal. 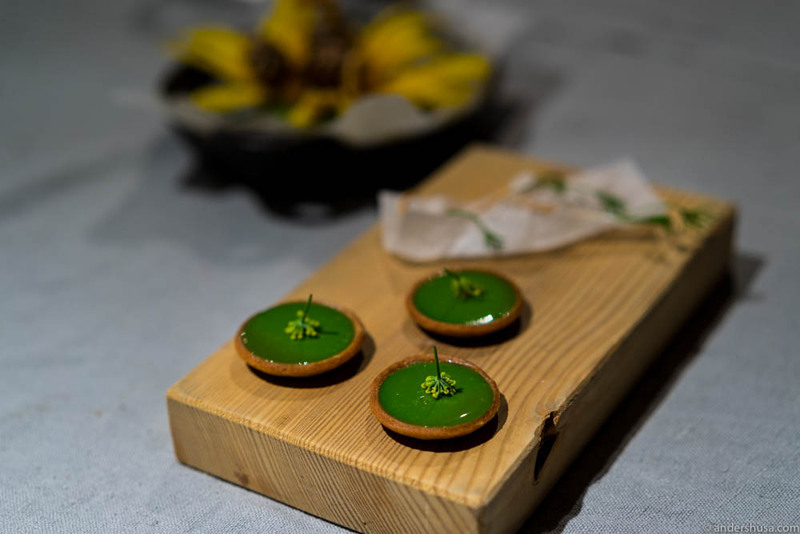 My good friend and fellow foodie from Hungary, Mr. World Traveler – Andras Jokuti, was so impressed with the stand alone bread serving at Taubenkobel that he dedicated an entire article to the course. Obviously, we had high expectations, but I’m glad to say they were exceeded. 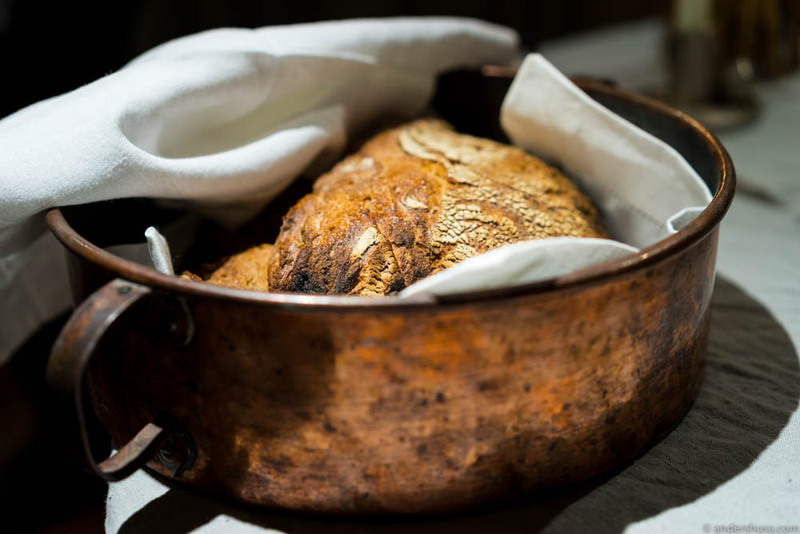 I’ll never forget the sound of the homemade bread, straight out of the wood-fired oven, as Barbara broke it apart by hand. So much crunchiness, followed by aromas that spread across the table. It came with a whole range of toppings: butter, pork fat, thistle oil, sorrel, herbs, lardo, salami, and cooked ham. One stood out for me, though, and that was the browned, caramelized butter. It’s simply the best thing in the world. Hands down. Nothing can beat that flavor. Browned caramelized butter – the best thing in the world! An uncooked duck was showcased early on in the meal. 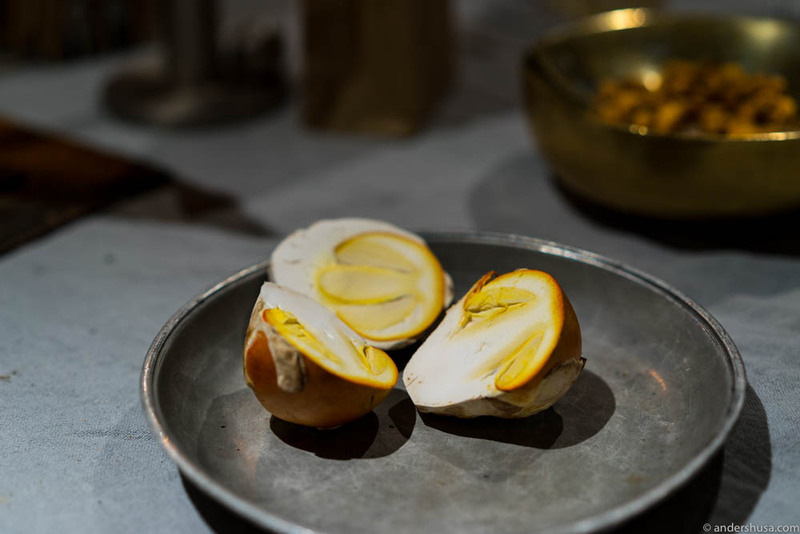 – We will cover it in duck fat and cook in the wood-fired oven. After two hours it will come back on the table for you, our waiter explained. Lo and behold, a couple of hours later and, indeed, the duck made a re-entrance. 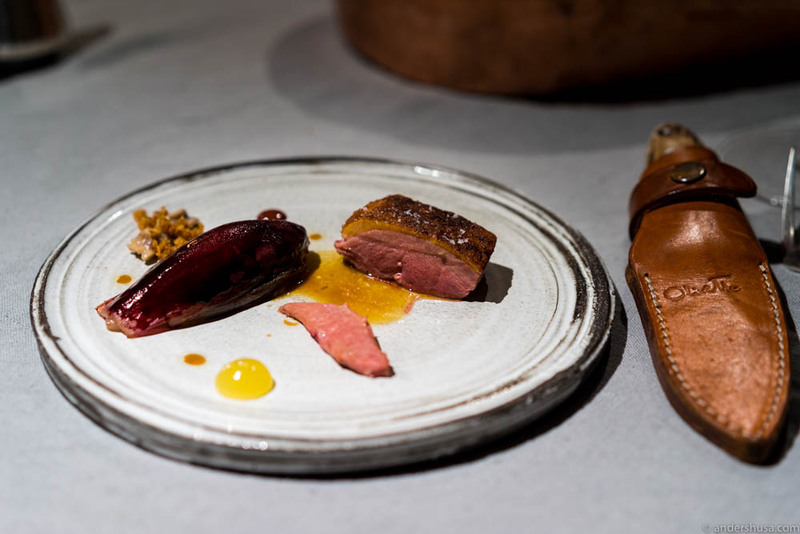 Cooked to perfection, laying on our plates, was a piece of duck breast fillet with grilled skin, a slice of the duck’s tongue (a first for me), and crispy duck fat. All served with bitter red chicory, lemon jam, and a duck sauce. Simply delicious. In particular, the combination of duck and the lemon gel, which had vanilla notes, was excellent. In addition to all the lovely natural wines this evening, we also got a non-alcoholic juice pairing to go with each dish. 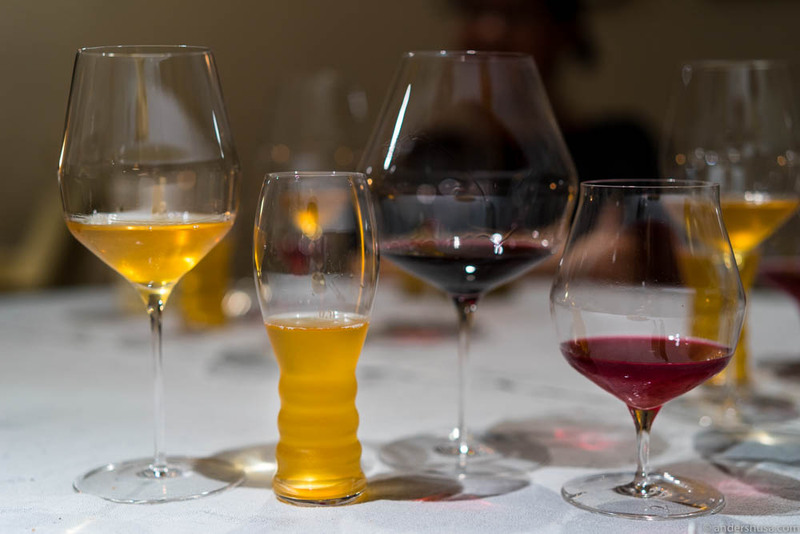 – With the wines, I can choose a good pairing, but with the juices, I can really get creative, Peter, the sommelier, explained. 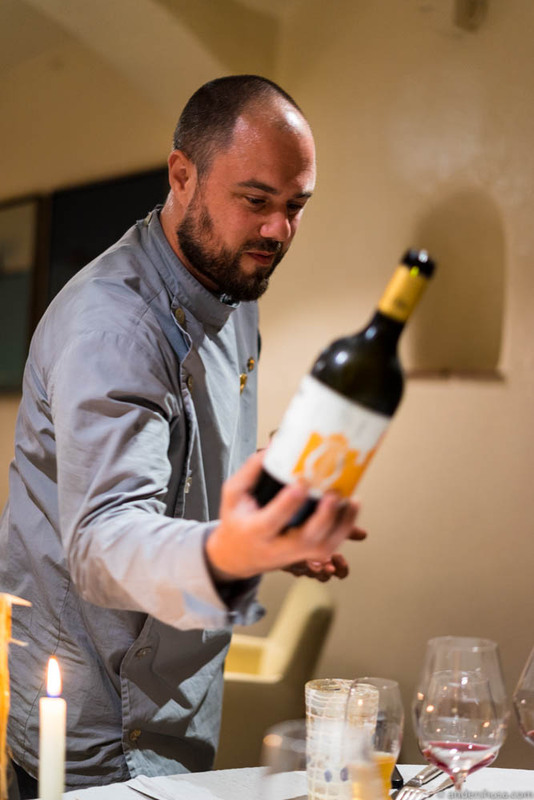 – We try everything together in the kitchen, with both the wine and the non-alcoholic pairing. I am so happy to work with a chef that is actually interested in tasting each combination, and who cooperate with me to improve the flavors. Turns out, chef Alain has a thing for savory desserts, or savory-sweet to be correct. 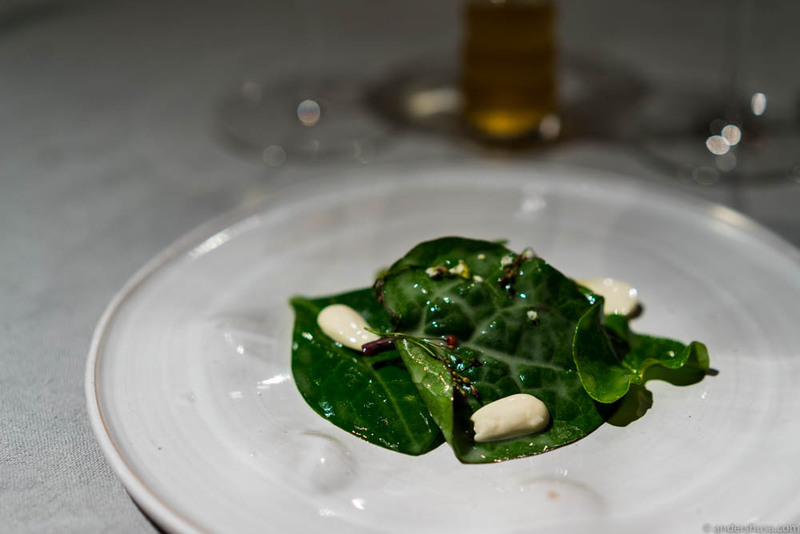 The last dish consisted of different spinach varieties, green almonds, and a sweetened sour cream. Sweet, yes, but also bitter, green, nutty, and acidic. Very weird, but in a good way. Definitely better with the apple juice pairing than the wine pairing, in this case, which I found simply too dry to match well. However, there were sweet-sweet desserts too. Actually, three of them, and as French as they could possibly get! 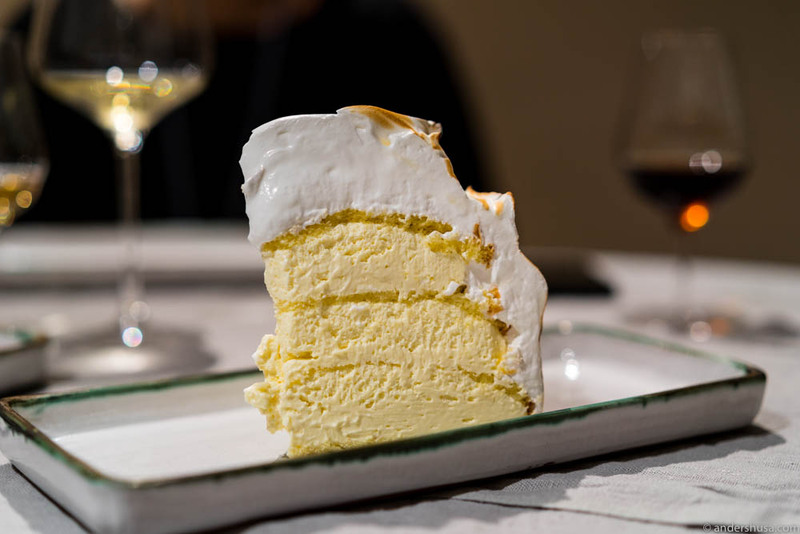 We were offered the choice of a tarte tatin with vanilla ice cream, a mille-feuille with salty caramel mousse, and a vanilla meringue layered cake. – Of course, we have to do all! I exclaimed. – Oh my God, I heard chef Alain say in the background. – That’s the correct answer. Thank you, Sir. Even if it means that you have to lie on the side tonight, Peter replied. He was right. That night, we slept very well. Probably dreaming about creamy mousse and crunchy layers of butter-dough, as only a proper French finish like this could have procured. Do you know a hidden gem that I should visit? Tip me off in the comments below. Hey Anders, thank you for the mention! I’m glad you enjoyed it, too! Thanks for the recommendation, Yngve. do you remember what brand are those glasses? Unfortunately, no. They are super nice!